DINK, Denver, Co | it's yaytime! I’m honored to be a guest this year at DINK! 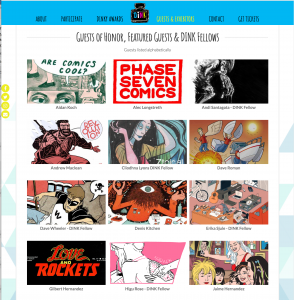 DINK is a fun, first-class expo emphasizing the independent spirit, cultural relevance, imagination, and community of comics, graphic novels, zines, art, publishers, and fans. Our mission to promote and further the impact of their work on the world. Internationally renowned creators as well as local Denver artists will appear. I will be there both Saturday and Sunday and will be hosting a workshop for kids, so be sure to check the program! This entry was posted in Events and tagged appearances, Comics Convention, Denver, DINK. Bookmark the permalink.